A couple of years ago, I did a post on making jams and jellies without a water bath. I’m still getting hits on that post and it has generated more comments than anything else I’ve put up. Part of the reason I posted on the topic was that I have long felt the USDA canning guidelines are — well, instead of what I was going to say, how about overly obsessive? Repeat after me: Just because the USDA says to do something a certain way doesn’t mean there aren’t other perfectly good options. Having learned over the years that many edicts, shibboleths and thou shalts from scientists and professionals ain’t necessarily so, it occurred to me that there’s another issue to discuss: reusing commercial jars with what are called lug caps. If you buy a jar of jam, jelly, pickles or relish, the odds are high that it is sealed with a lug cap. The inside of that cap has a ring or layer of what is called Plastisol, which takes the place of the rubberized ring on a standard canning jar lid. 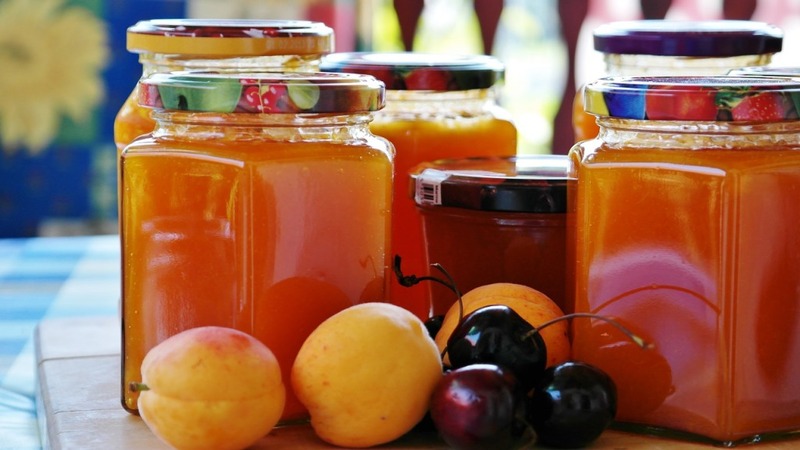 Should you ask folks at a place like the USDA, they will tell you to store dry foodstuffs, nuts and bolts or similar items in those lug-top jars and use standard canning jars for all home canning, including jam and jelly. The USDA, like most bureaucracies, operates on the principle that one should never stick one’s neck out. Thus it makes only the most conservative of recommendations. Check most canning websites (say Ball and Kerr) and you will find similar advice. Ummm, those folks are trying to sell you glass canning jars… why would they want you to do something that would reduce their sales? 1. Some lug top jars are of a shape that doesn’t fit easily into a canner. That standard commercial pickle jar, for example — you might get three in a standard pressure canner. I’m more likely to use those for storing fermented pickles and vegetables. I generally start the fermentation in a glass gallon jar, as there’s plenty of room to put in more veggies every day when I come in from the garden. Once I’m ready to store them, I decant the veggies and brine into these pickle jars and refrigerate (I don’t have a root cellar — darn it — but if I did I would have no hesitation about storing them there instead of the fridge). 2. As with any storage container that you will be using for canned goods, the jar and lid must be thoroughly washed. Check the jar for nicks or cracks. Make sure the lid isn’t bent and that the Plastisol doesn’t have any gouges or cuts. 3. Both jars and lids must be submerged and heated in boiling water to sterilize them before the hot food is placed in them. Leave them in the hot water until you are ready to pour in the food. Lug jar lids are a little harder to handle than canning jar lids and rings, so make sure you have a good pair of oven mitts. What I usually do is lift them out with a pair of tongs, shake off the hot water and drop the lid upside down in my gloved hand. Then I place the lid on the jar and tighten. 4. Do not tighten the lid too tight; screw it on just to the point where it feels snug. If you tighten it too much, you’ll either be breaking the jar or punching a hole in the lid to get your food out. The combination of hot food and hot jar will create a vacuum as the jar cools. This is what creates the vacuum that seals the lid. 5. For things like jams and jellies, I don’t worry about whether the jar is a standard size, as I’m not going to water bath or pressure can them. If you’re doing something like peaches, green beans or applesauce, I recommend you use only jars that are either pint or quart size. Processing times are developed for standard-size jars; if you use an off-size it may be over- or under-processed. 6. Lug jars typically have a button on top that indicates when the jar has sealed properly. As long as the button or the jar top is depressed, you’ll have a good seal. If not, store in the fridge, and plan to use that jar for something other than canning from now on. So yes, that means you can continue to reuse these jars for several years. Even if you happen to grab a jar that has lost its sealing ability, it’s not a disaster. Your food is fine as long as you refrigerate and use it within a week or so. So strike another blow for freedom from the food police and use your common sense! This entry was posted in Food, Health, Money Matters and tagged canning, jams, jars, jellies, lug top, Plastisol, USDA. Bookmark the permalink. Can you please help me with sterilization of the jars with plastisol lug lids with pop up button. Is it ok to boil the plastisol lid? Does the boiling in water damage the plastisol? Your help dry much appreciated. Thank you. My understanding of these lids is that they are supposed to be simmered for 10 minutes prior to using. To simmer, bring the water to a boil and then turn it down until an occasional bubble breaks the surface. The other thing I know is important is that you shouldn’t tighten them too much as it prevents the jars from venting (which is true of all canning jar lids). Once you feel the sealing compound make contact with the jar rim, stop. After they’ve been processed, the center pop-up button should be indented to indicate you have a good seal. Hi Bee, thank you for your reply. Another dellima I have, should I boil the jars in hot water bath after filing them or not. Because I did do a test of the jars skipping the hot water boiling just hot fill and pop up bottom got concave when the jar is cold and when I opened the jar it had pop sound. If you are making jams and jellies, boiling is unnecessary (see this post: http://www.jeffersonsdaughters.com/?s=water+bath). Just make sure you have a good seal once the jars cool – otherwise, store them in the fridge. For other foods, you will need to either water bath or pressure can – follow the recipe instructions. We have two spaghetti sauce jars we have been reusing for our orange marmalade for a few years now. We’ve used them six times so far and they continue to reseal every time. All of our pickles this year went into store-bought pickle jars, and every one of them sealed. Don’t you just love it when you get to prove the “experts” wrong, over and over again!?! ?